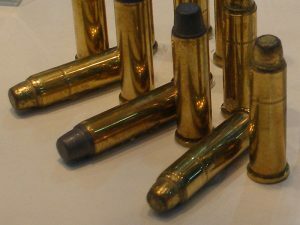 In the mid-1990s, Swiss-German arms manufacturer SIG Sauer teamed up with Federal Cartridge (now Federal Premium Ammunitions) to develop a new cartridge to rival the .357 Magnum. The team designed the .357 SIG after the .357 Mag to duplicate the performance of the .357 Mag while offering shooters a higher cartridge capacity to be used in semi-automatic pistols. The target audience was law enforcement, which never fully embraced the new round. The .357 SIG ammo was introduced in 1994, only four years after the S&W released their .40 cal. The .40 S&W had been commissioned by the FBI after the 1986 Miami shootout in which two agents were killed and five were wounded. The FBI had requested a new load that would have the power of a .45 with lower recoil and faster reloading time. Although the .40 S&W wasn’t a perfect replacement, it was readily adopted by law enforcement agencies throughout the U.S.
At that time, neither law enforcement agencies nor the public was ready to embrace another round for a semi-automatic weapon. Therefore, the .357 SIG never caught on despite its superior performance record. SIG designed the original of .357 SIG ammo was .357”, but then reduced the overall size to .355”, making it easier to reload. SIG created the first bottleneck commercial handgun cartridge manufactured since the early 1960s. Like the .357 Mag, it uses a bullet with 125 grains. It boasts an average velocity of 1,450 FPS and muzzle energy that exceeds 500 ft. lbs. The shoulder is alpha/2=18 degrees. The common rifling twist rate is 406 mm (1 in 16 in), 6 grooves, Ø lands=8.71 mm, Ø grooves=9.02 mm, land width=2.69 mm. The primer type is small pistol. The performance and smaller dimensions of the .357 SIG should make it a more popular cartridge among law enforcement, but it has never caught on. Many officers have chosen to adapt to a 9 mm Parabellum for their standard sidearm. It is a preferred round for many target shooters and those interested in home defense and self-defense. Unlike some smaller rounds, the .357 SIG is capable of causing hydrostatic shock, disabling, or even fatally wounding its targets upon impact. Many large law enforcement agencies supply their officers with .357 SIG ammunition. Officers use the ammo in SIG Sauer models and Glock pistols. The Texas Highway Patrol adopted the round in 1995. The Texas Department of Public Safety (DPS) followed suit. They had previously given their troopers a choice between the SIG Sauer P220 in .45 ACP or the SIG Sauer P226 in 9mm. From 1998-2013, The DPS issued the SIG Sauer P226 chambered in .357 SIG as a standard sidearm for its commissioned officers.